A Chandra X-ray Observatory image of the stars around Polaris (identified with an A). The other labels mark the positions of stars seen in the visible and thought to be physically associated with Polaris A. 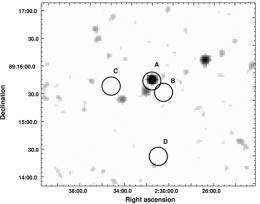 (PhysOrg.com) -- A Cepheid star is one whose mass and age results in physical conditions that generate periodic oscillations in its photosphere. A Cepheid thus varies regularly in brightness, with a period proportional to its intrinsic luminosity. This extraordinarily useful property of Cepheid variables, discovered and calibrated at Harvard by Henrietta Leavitt in 1908, allows them to act as reliable cosmic distance calibrators. By comparing the intrinsic brightness as determined from a period (which is easily measured) with the measured brightness, a precise distance can in principle be obtained. Cepheids in distant galaxies that are receding from us provide the basis for the famous distance-velocity relationship of galaxies that underpins the expanding universe model (the "big bang" model). The North Star, Polaris, is not only renowned as a reliable beacon for early navigators. It is also the closest Cepheid to earth (about 425 light-years away), and a subject of intense study. One issue is whether, like many stars, it is associated with a cluster of small companion stars that could have affected its evolution. In fact Polaris itself ("Polaris Aa", whose mass is 4.5 solar-masses) is known to orbit with a close companion, Polaris Ab (whose mass of 1.3 solar-masses). The pair orbit at a separation of about 15 astronomical units, about as far apart as Uranus is from the sun. Another nearby star, Polaris B, seems to be orbiting around the other two at a distance 100 times farther away. Two more stars nearby, Polaris C and D, might also be faint companions that some astronomers think are gravitationally bound to the others. Four CfA astronomers, Nancy Evans, Scott Wolk, Margarita Karovska, and Bradley Spitzbart, together with four colleagues, used the Chandra X-ray Observatory to probe the cluster properties of the stars in the Polaris complex. They relied on the fact that young, low mass stars emit relatively strong X-rays. Chandra has the sensitivity to spot any such small stars clustering in the Polaris group, and can distinguish between them and other kinds of X-ray emitting stars that might be seen in the same field-of-view. In particular, Chandra can find stars that might be too faint (or too close to another star) to be seen in the optical, down to a mass potentially twenty times less than that of Polaris Aa. The presence or absence of small companion stars would help determine the history of the cluster, for example, if it ever had a close encounter with another star that could have perturbed the cluster. In a new paper, the scientists report that they do not see such low-mass companions, but they conclude based on the X-ray properties that Polaris C and D are probably not physical members of the system, while Polaris B is a member, and is a single star.